About two years ago when I decided to leave the law firm where I was working and open my own solo practice law office I was driven by the decision to provide Affordable Convenient Legal Services to clients throughout North Dakota. My goal is to create a statewide virtual law office where I can provide legal services to clients any where in North Dakota. To reach my goal I am using a combination of more than 30 years of experience helping clients, low overhead and modern technology. In Volume 1 of Under the Hood I talked about my experience with our first office computer the Kaypro and my current client relationship management (CRM) application Lexicata. My MacBook Air attached to 40″ RCA television as computer monitor. The heart of my office is my MacBook Air. Here you can see my MacBook Air in use on my desk attached to my 40” RCA television that I use for a monitor when I am working at my desk. (Don’t be concerned, the TV is not levitating, it is attached to the wall on a swing arm mount.) Large screen monitors or multi-monitors are the only efficient way to operate when you are doing research and writing a brief. 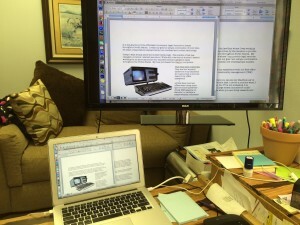 Since I decided that my new office would be based on new technology and a new approach to the practice of law, I decided to also include an Apple computer rather than a traditional Microsoft windows based machine that is traditionally used in a business office. Major factors in my Apple decision were reliability and security. Also since most new legal applications are cloud based it really makes little difference what type of computer you use to access the internet. I wanted a laptop computer which allows me to work at home and also work from other out of office locations. Traditionally laptops did not have a long life expectancy because constantly moving the hard drive created problems. My MacBook Air has no moving parts inside. The storage is all on memory chips. There is no spinning hard drive to get out of whack. So far so good, more than two years of use, back and forth to home and work everyday and no problems. Technology is changing the practice of law. I can provide my clients with the ability to review and sign documents at their home or work. No need to waste time traveling to the attorney’s office and sitting in the waiting room while the attorney talks to someone else on the phone. I am also able to provide free initial consultations by email using my website www.eLawPros.com. Modern technology allows me to better serve my clients. Modern technology allows me to keep my office overhead low, which allows me to keep my fees as low as possible. I can get more done faster which means I can charge my clients less. From your prospective as a client you want the best legal services at the lowest possible cost. I use modern technology to provide my legal services at the lowest possible cost. This look under the hood of my practice will help you understand how I can provide Convenient Affordable Legal Services to all of my North Dakota clients.